EZ Fast Blood/Cell PCR Genotyping Kit is designed for rapid extraction and amplification of genomic DNA from whole blood, blood dried on a blood card and cultured mammalian cells without DNA purification. With EZ Fast Blood/Cell PCR Genotyping Kit the extraction of genomic DNA is a simple fast single-tube procedure. Briefly, the DNA is released from the blood or cells to the Blood Lysis Solution by 5-15 minute incubation of the sample with the Blood Lysis Solution. There is no need for organic extraction and precipitation of the DNA. After neutralization, the DNA extraction is ready for PCR. An aliquot of the DNA extraction is mixed with a 2X PCR Ready Mix included in the kit and user-selected primers to amplify target DNA. The 2X PCR Ready Mix containing buffer, dNTP and Taq polymerase is specially optimized for use with the extracted DNA. The 2X PCR Ready Mix contains an inert red dye that allows direct loading of PCR products onto agarose gels to visualize amplified target. DNA was extracted from 10 ul of whole blood in 5 minutes and PCR amplification of the target genes was carried out using the EZ Fast Blood/Cell PCR Genotyping Kit. 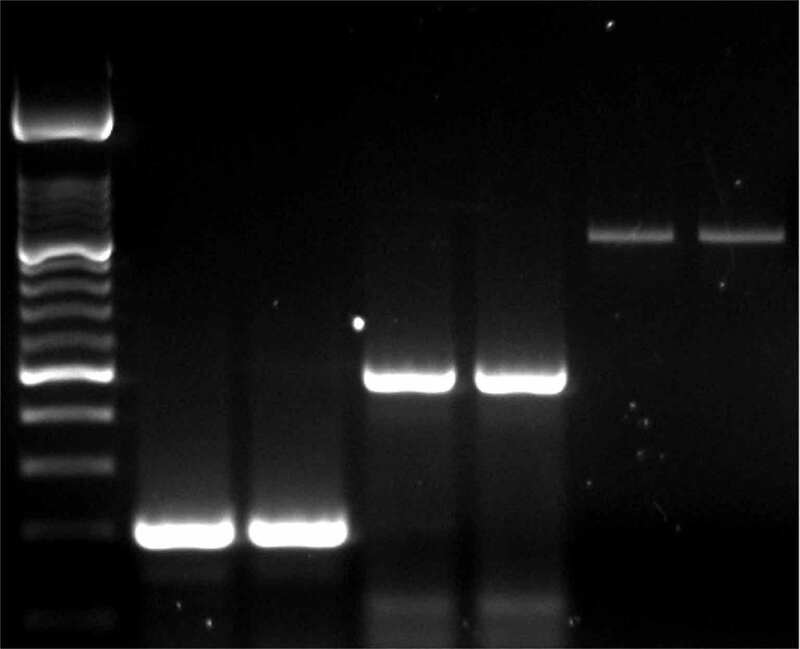 Amplified DNA fragments (220 bp in lanes 1-2, 498 bp in lanes 3-4 and 938 bp in lanes 5-6) were analyzed on a 2% agarose gel. M: 100 bp ladder.